“Suicide Squad” has been bashed so much for the past week I don’t feel the need to keep it going. Though, at the same time it can’t quite be defended. It’s not really a great movie, but when you look back at other not-so-great super hero adaptations (ie “Green Lantern”) you realize it’s entertaining to a certain point and nowhere near as bad as many claim. Hot off the controversially received “Batman v Superman: Dawn of Justice” Warner Bros has given us their latest attempt to cash-in on what those Marvel geniuses have been working on for nearly a decade. It’s certainly something you can’t build overnight. “Suicide Squad” is at least an attempt to give us something a little different from the DC world and at least it’s one not directed by Zack Snyder. Initially visually appealing, with an obvious but enjoyable soundtrack, “Suicide Squad” is entertaining enough, and even though it's basically a mess and generally underwhelming, it does feature a few decent performances by actors who should have had their own movies before this ultimately convoluted film made it to the big screen. 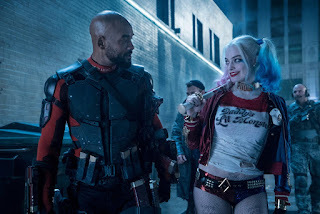 “We’re bad guys,” the clown-faced Harley Quinn says at one point, and that’s true though the movie tries so hard to make them likable you feel like your own morals are being compromised. But she’s so charming! And she is. It’s because she’s played by Margot Robbie, who has been destined for stardom since her breakout role in “The Wolf of Wall Street” just a few years ago. Even if I don’t quite get her character – or why the corrupt intelligence operative Amanda Waller (Viola Davis) would want her non meta-human skills for this group of meta-human criminals, but more on that later – Robbie fits so nicely into the role she could have easily headlined her own film. The fact that her onscreen lover Joker (Jared Leto) is so oddly not thought out (is he just a clown-faced Scarface or what?) feels like a gross miscalculation. There’s nothing particularly wrong with Leto’s performance, I just don’t get this version of the character or how he really fits into this story (he’s not even part of the Suicide Squad). I don't even remember him making a joke. The only other character that was interesting was played by Will Smith – a gifted actor, who gets extra points for sitting out Independence Day Resurgence earlier this summer. He plays Deadshot who by my calculations feels like DC’s version of Deadpool. Maybe it’s because their names are so similar and the fact that they’re both guns for hire? Deadshot, who has a disturbingly good aim, is basically a serial killer but he has a young daughter who he doesn't get to see anymore since he was captured by Batman (Ben Affleck returns). There are a bunch of other sorted characters—portrayed by a decidedly diverse cast of actors—which the movie takes nearly 45 minutes to explain in one of the longest sequences of exposition in cinematic history; and yet you don’t really get to know any of them. 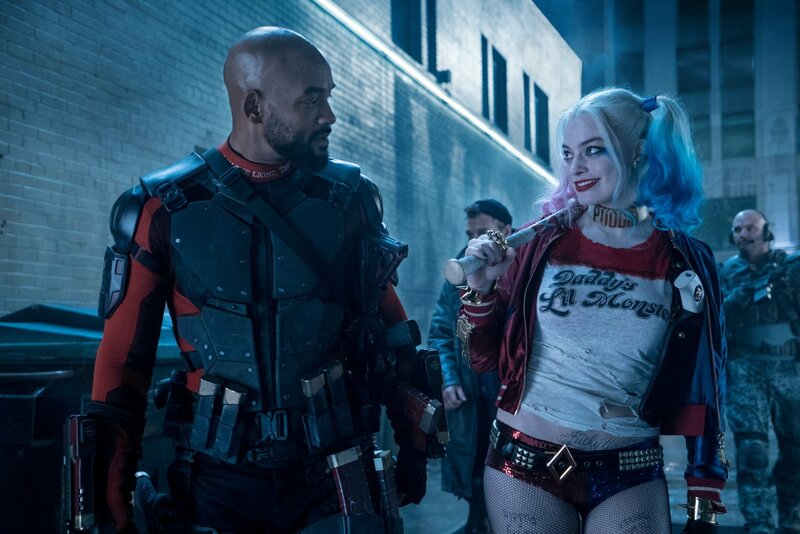 Harley Quinn and Deadshot are the only ones worth caring about and the filmmakers know it. Remember I mentioned Viola Davis? She’s here on a break from teaching law students how to get away with murder to form a secret squad of bad guys for… doing stuff? Some evil enchantress figures into it somehow and causes some kind of mass chaos in Midway City which is supposedly DC’s version of Chicago. In exchange for basically being forced into this “Suicide Squad” the prisoners are granted shorter prison sentences. The second half of the movie is watching these bad guys let loose on a nearly devastated and desolate city as they try to catch the really, really bad guy. Feature Trailer for Suicide Squad on TrailerAddict.